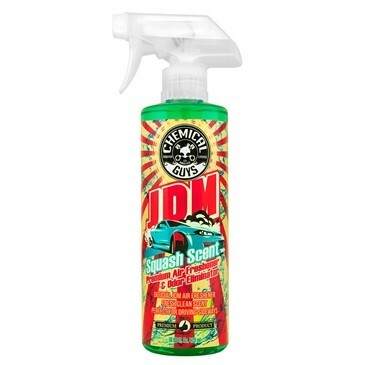 Chemical Guys JDM Squash Scent revitalizes and refreshes any dank automobile interior with invigorating fragrance. 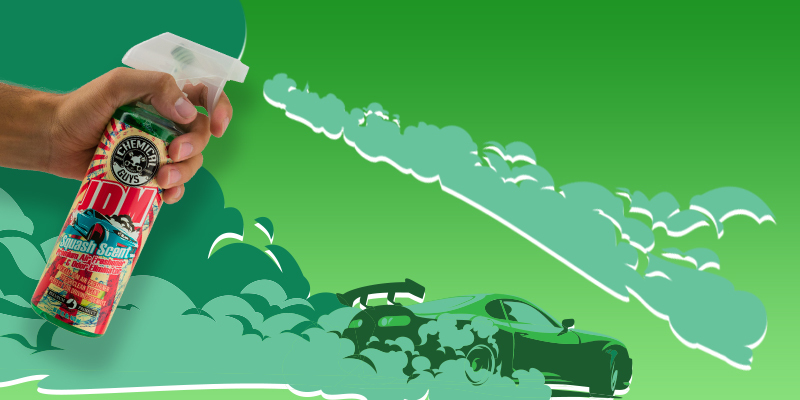 Fans of JDM cartridge air fresheners will love Chemical Guys JDM Squash Scent! Squash air freshener does not smell like a gourd, or a fruit for decorative purposes during the fall and winter months, it combines a full-bodied fresh and clean soapy scent with subtle citrus top notes and a candy finish. Easily mist the convenient sprayable formula into any carpets, seats, upholstery, and floor mats in and around every car, truck, RV, or SUV. Want to smell it everywhere? Mist Chemical Guys Squash around the home, office, locker room, man cave, and any other enclosed space that needs a refreshing boost. Chemical Guys scents are not just air fresheners; they’re odor eliminators as well. Speciality enzymes seek out and destroy odor-causing elements to eliminate and prevent foul smells right at their source. Use JDM Squash Scent during an AC system purge to replace AC stenches with fresh crisp cool air. Choose Chemical Guys JDM Squash Scent Air Freshener & Odor Eliminator for the fresh clean scent of sideways cruises in any JDM ride. Chemical Guys JDM Squash Scent Air Freshener captures the nostalgic scent of your first car. All the hours spent tuning the sport coupe, hatchback, or sedan so it could drive sideways were made worth it after breaking the rear end loose on a closed course under professional supervision. All those back road trips and highway pulls were made sweeter with the authentic JDM cartridge air fresheners attached to the dashboard. But now you can mist that pleasing fresh aroma anywhere without any double-sided tape with Chemical Guys JDM Squash Scent! Simply mist 2-3 sprays of JDM Squash Scent inside the vehicle to replace stale air with fresh clean fun. Treat every type of car, truck, or SUV, regardless of make or country of origin, with the fresh JDM scent of Chemical Guys Squash Scent. 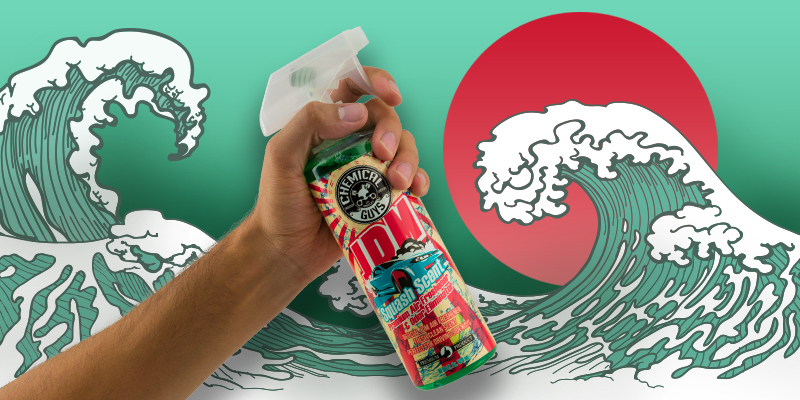 Chemical Guys engineered JDM Squash Scent Air Freshener with active odor eliminators and neutralizers to rapidly subdue undesirable smells right at the source. JDM Squash Scent pleases the senses with the fresh scent of cleanliness and fresh air. Squash is the original JDM air freshener scent! Squash Air Freshener & Odor Eliminator is enriched with clean overtones, delivering a fresh scent that lasts weeks, not days. One spray is all you need for a full size vehicle. 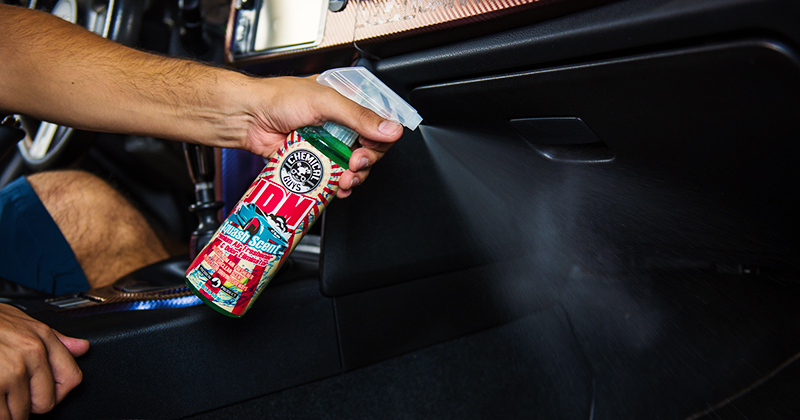 Enjoy the luscious scent of tuned up drift machines with Chemical Guys JDM Squash Scent Air Freshener & Odor Eliminator. JDM Squash Scent Premium Air Freshener & Odor Eliminator is available in 4 ounce size.